Bespoke KS2 Recycled Plastic Activity Trail and Grass Mats Safer Surfacing. 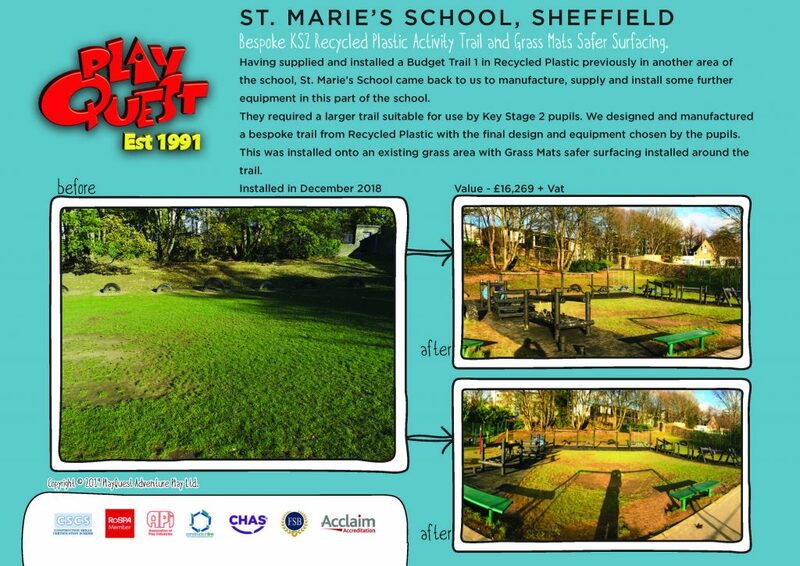 Having supplied and installed a Budget Trail 1 in Recycled Plastic previously in another area of the school, St. Marie’s School came back to us to manufacture, supply and install some further equipment in this part of the school. They required a larger trail suitable for use by Key Stage 2 pupils. We designed and manufactured a bespoke trail from Recycled Plastic with the final design and equipment chosen by the pupils. This was installed onto an existing grass area with Grass Mats safer surfacing installed around the trail.